The 1999 NFL draft was the procedure by which National Football League teams selected amateur college football players. It is officially known as the NFL Annual Player Selection Meeting. The draft was held April 17–18, 1999, at the Theater at Madison Square Garden in New York City, New York. The league also held a supplemental draft after the regular draft and before the regular season. 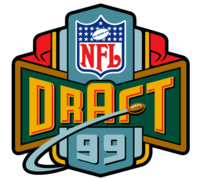 Five quarterbacks were selected in the first round - Tim Couch, Donovan McNabb, Akili Smith, Daunte Culpepper, and Cade McNown - the second most (along with the 2018 NFL Draft) after the 1983 NFL Draft. Only McNabb and Culpepper, however, would have successful careers, while Couch, Smith, and McNown are generally regarded as draft busts. McNabb, the most successful of the five, was also the only first-round quarterback from the draft to appear in the Super Bowl. The draft is also noted for the Ricky Williams trade, which saw the New Orleans Saints trade all six of their draft picks to the Washington Redskins for the fifth overall selection in order to draft running back Ricky Williams. New Orleans finished with a 3-13 record following the trade and Williams struggled as a rookie, resulting in the firing of Saints head coach Mike Ditka and general manager Bill Kuharich. In the explanations below, (PD) indicates trades completed prior to the start of the draft (i.e. Pre-Draft), while (D) denotes trades that took place during the 1999 draft. No. 5: Washington → New Orleans (D). Washington traded its first-round selection (5th) to New Orleans in exchange for New Orleans' first-, third-, fourth-, fifth-, sixth-, and seventh-round selections (12th, 71st, 107th, 144th, 179th, and 218th), as well as New Orleans' 2000 first- and third-round selections (2nd and 64th). ^ No. 7: Chicago → Washington (D). Chicago traded its first-round selection (7th) to Washington in exchange for Washington's first-, third-, fourth-, and fifth-round selections (12th, 71st, 106th, and 143rd), as well as Washington's 2000 third-round selection (87th). ^ No. 8: San Diego → Arizona (PD). San Diego traded its first-round selection (8th), running back Eric Metcalf, linebacker Patrick Sapp, and its 1998 first- and second-round selections (3rd and 33rd) to Arizona in exchange for Arizona's 1998 first-round selection (2nd). ^ No. 11: Washington → Minnesota (PD). Washington traded its first- and third-round selections (11th and 73rd), as well as its second-round selection in 2000 (56th) to Minnesota in exchange for quarterback Brad Johnson. No. 12: New Orleans → Washington (D). see No. 5: Washington → New Orleans. No. 12: Washington → Chicago (D). see No. 7: Chicago → Washington. ^ No. 17: Seattle → New England (D). Seattle traded its first-round selection (17th) to New England in exchange for New England's first-, third-, and sixth-round selections (20th, 82nd, and 191st). No. 20: New England → Seattle (D). see No. 17: Seattle → New England. No. 20: Seattle → Dallas (D). Seattle traded its first-round selection (20th) to Dallas in exchange for Dallas' first- and fifth-round selections (22nd and 140th). ^ No. 22: Dallas → Seattle (D). see No. 20: Seattle → Dallas. ^ No. 24: Miami → San Francisco (D). Miami traded its first-round selection (24th) to San Francisco in exchange for San Francisco's first- and fifth-round selections (27th and 134th). No. 27: San Francisco → Miami (D). see No. 24: Miami → San Francisco. No. 27: Miami → Detroit (D). Miami traded its first-round selection (27th) to Detroit in exchange for Detroit's second-, third-, and fifth-round selections (39th, 70th, and 142nd). ^ No. 28: NY Jets → New England (PD). NY Jets traded its first-round selection (28th), as well as its third- and fourth-round selections in 1997 (61st and 97th), and second-round selection in 1998 (52nd) to New England as compensation for hiring head coach Bill Parcells in 1997. ^ No. 34: Indianapolis → Carolina (PD). Indianapolis traded its second-round selection (34th) to Carolina in exchange for cornerback Tyrone Poole in 1998. ^ No. 36: St. Louis → Indianapolis (PD). St. Louis traded its second- and fifth-round selections (36th and 138th) to Indianapolis in exchange for running back Marshall Faulk. ^ No. 37: Chicago → Washington (D). Chicago traded its second-round selection (37th to Washington in exchange for Washington's second- and fifth-round selections (40th and 144th). ^ No. 39: Detroit → Miami (D). see No. 27: Miami → Detroit. No. 40: Washington → Chicago (D). see No. 37: Chicago → Washington. No. 40: Chicago → Oakland (D). Chicago traded its second- and fourth-round selections (40th and 102nd) to Oakland in exchange for Oakland's second-, third-, and fourth-round selections (48th, 78th, and 111th). ^ No. 41: New Orleans → St. Louis (PD). New Orleans traded its second-round selection (41st) to St. Louis in exchange for wide receiver Eddie Kennison. ^ No. 42: Baltimore → Atlanta (D). Baltimore traded its second-round selection (42nd) to Atlanta in exchange for Atlanta's first-round selection in 2000 (5th). ^ No. 43: Kansas City → Miami (D). Kansas City traded its second-round selection (43rd) to Miami in exchange for Miami's second- and third-round selections (54th and 84th), as well as its sixth-round selection in 2000 (188th). ^ No. 44: Pittsburgh → Minnesota (D). Pittsburgh traded its second-round selection (44th) to Minnesota in exchange for Minnesota's second-, third-, and fifth-round selections (59th, 73rd, and 163rd). ^ No. 46: Tennessee → New England (D). Tennessee traded its second-round selection (46th) to New England in exchange for New England's second- and fourth-round selections (52nd and 117th). ^ No. 47: Seattle → Green Bay (PD). Seattle traded its second-round selection (47th) to Green Bay as compensation for signing head coach Mike Holmgren in 1999. ^ No. 48: Oakland → Chicago (D). see No. 40: Chicago → Oakland. ^ No. 52: New England → Tennessee (D). see No. 46: Tennessee → New England. ^ No. 54: Miami → Kansas City (D). see No. 43: Kansas City → Miami. ^ No. 59: Minnesota → Pittsburgh (D). see No. 44: Pittsburgh → Minnesota. ^ No. 60: Atlanta → San Diego (PD). Atlanta traded its second-round selection (60th) to San Diego in exchange for wide receiver Tony Martin in 1998. No. 70: Detroit → Miami (D). see No. 27: Miami → Detroit. No. 70: Miami → Detroit (D). Miami traded its third-round selection (70th) to Detroit in exchange for Detroit's third- and seventh-round selections (72nd and 232nd). No. 71: New Orleans → Washington (D). see No. 5: Washington → New Orleans. No. 71: Washington → Chicago (D). see No. 7: Chicago → Washington. No. 72: Baltimore → Tampa Bay (PD). Baltimore traded its third-round selection (72nd) to Tampa Bay in exchange for running back Errict Rhett in 1998. No. 72: Tampa Bay → Baltimore (PD). Tampa Bay traded its third-round selection (72nd) to Baltimore in exchange for Baltimore's 1998 fourth-round selection (104th). No. 72: Baltimore → Detroit (PD). Baltimore traded its third-round selection (72nd) as well as its fifth-round selection in 2000 (150th) to Detroit in exchange for quarterback Scott Mitchell. No. 72: Detroit → Miami (D). see No. 70: Miami → Detroit. No. 73: Washington → Minnesota (PD). see No. 11: Washington → Minnesota. No. 73: Minnesota → Pittsburgh (D). see No. 44: Pittsburgh → Minnesota. ^ No. 78: Oakland → Chicago (D). see No. 40: Chicago → Oakland. ^ No. 82: New England → Seattle (D). see No. 17: Seattle → New England. ^ No. 84: Miami → Kansas City (D). see No. 43: Kansas City → Miami (D). ^ No. 91: Minnesota → New England (PD). Minnesota traded its third-round selection (91st) to New England in exchange for cornerback Jimmy Hitchcock. No. 96: Cleveland → San Francisco (PD). Cleveland traded its fourth- and fifth-round selections (96th and 134th) to San Francisco in exchange for San Francisco's fourth-round selection (124th) and quarterback Ty Detmer. No. 96: San Francisco → Indianapolis (D). San Francisco traded its fourth-round selection (96th) to Indianapolis in exchange for Indianapolis' fourth- and sixth-round selections (99th and 171st). ^ No. 99: Indianapolis → San Francisco (D). see No. 96: San Francisco → Indianapolis. ^ No. 102: Chicago → Oakland (D). see No. 40: Chicago → Oakland. ^ No. 106: Washington → Chicago (D). see No. 7: Chicago → Washington. ^ No. 107: New Orleans → Washington (D). see No. 5: Washington → New Orleans. ^ No. 110: Cleveland → San Francisco (D). Cleveland traded its fourth-round selection (110th) to San Francisco in exchange for fullback Marc Edwards. ^ No. 111: Oakland → Chicago (D). see No. 40: Chicago → Oakland. ^ No. 117: New England → Tennessee (D). see No. 46: Tennessee → New England. ^ No. 120: Miami → Minnesota (PD). Miami traded its fourth-round selection (120th) to Minnesota as compensation for signing restricted free agent tight end Hunter Goodwin in 1999. ^ No. 122: Green Bay → Buffalo (PD). Green Bay traded its fourth-round selection (122nd) to Buffalo Bills in exchange for running back Darick Holmes in 1998. ^ No. 124: San Francisco → Cleveland (PD). see No. 96: Cleveland → San Francisco. No. 134: Cleveland → San Francisco (PD). see No. 96: Cleveland → San Francisco. No. 134: San Francisco → Miami (D). see No. 24: Miami → San Francisco. ^ No. 136: Indianapolis → Pittsburgh (PD). Indianapolis traded its fifth-round selection (136th) to Pittsburgh in exchange for linebacker Steve Conley in 1998. ^ No. 137: Philadelphia → Detroit (D). Philadelphia traded its fifth-round selection (137th) to Detroit in exchange for Detroit's fourth-round selection in 2000 (111th). ^ No. 138: St. Louis → Indianapolis (PD). see No. 36: St. Louis → Indianapolis. ^ No. 139: Chicago → San Diego (PD). Chicago traded its fifth-round selection (139th) to San Diego in exchange for defensive tackle Shawn Lee in 1998. No. 140: Carolina → Dallas (PD). Carolina traded its fifth-round selection (140th) to Dallas as compensation for signing restricted free agent wide receiver Patrick Jeffers in 1999. No. 140: Dallas → Seattle (D). see No. 20: Seattle → Dallas. ^ No. 142: Detroit → Miami (D). see No. 27: Miami → Detroit. ^ No. 143: Washington → Chicago (D). see No. 7: Chicago → Washington. No. 144: New Orleans → Washington (D). see No. 5: Washington → New Orleans. No. 144: Washington → Chicago (D). see No. 37: Chicago → Washington. ^ No. 145: Baltimore → St. Louis (D). Baltimore traded its fifth-round selection (145th), as well as its seventh-round selection in 2000 (145th), to St. Louis in exchange for quarterback Tony Banks. ^ No. 146: Pittsburgh → Oakland (D). Pittsburgh traded its two fifth-round selections (146th and 163rd) to Oakland in exchange for Oakland's 2000 third-round selection (77th). ^ No. 147: Kansas City → Chicago (PD). Kansas City traded its fifth-round selection (147th) to Chicago in exchange for running back Bam Morris in 1998. ^ No. 157: Miami → San Francisco (PD). Miami traded its fifth-round selection (157th) to San Francisco in exchange for offensive guard Kevin Gogan in 1999. No. 163: Minnesota → Pittsburgh (D). see No. 44: Pittsburgh → Minnesota. No. 163: Pittsburgh → Oakland (D). see No. 146: Pittsburgh → Oakland. No. 163: Oakland → Green Bay (D). Oakland traded its fifth-round selection (163rd) to Green Bay in exchange for Green Bay's sixth-round selection (188th) and past considerations. ^ No. 165: Denver → Washington (D). Denver traded its fifth-round selection (165th) to Washington in exchange for Washington's sixth- and seventh-round selections (179th and 218th). ^ No. 170: Cleveland → Seattle (D). Cleveland traded its sixth-round selection (170th) to Seattle in exchange for Seattle's two sixth-round selections (187th and 191st). ^ No. 171: Indianapolis → San Francisco (D). see No. 96: San Francisco → Indianapolis. ^ No. 174: Chicago → Cleveland (D). Chicago traded its sixth-round selection (174th) to Cleveland in exchange for Cleveland's sixth- and seventh-round selections (184th and 207th). ^ No. 180: Baltimore → New England (PD). Baltimore traded its sixth-round selection (180th) to New England in exchange for tight end Lovett Purnell in 1999. No. 182: Kansas City → Tampa Bay (PD). Kansas City traded its sixth-round selection (182nd) to Tampa Bay in exchange for safety Melvin Johnson in 1998. No. 182: Tampa Bay → Jacksonville (D). Tampa Bay traded its sixth-round selection (182nd) to Jacksonville in exchange for Jacksonville's sixth- and seventh-round selections (195th and 233rd). ^ No. 183: Pittsburgh → NY Jets (PD). Pittsburgh traded its sixth-round selection (183rd) to NY Jets in exchange for wide receiver Alex Van Dyke in 1999. ^ No. 184: Cleveland → Chicago (D). see No. 174: Chicago → Cleveland. No. 185: Tampa Bay → Baltimore (D). Tampa Bay traded its sixth-round selection (185th) to Baltimore in exchange for quarterback Eric Zeier. No. 185: Baltimore → Minnesota (D). Baltimore traded its sixth-round selection (185th) to Minnesota in exchange for offensive guard Everett Lindsay. ^ No. 187: Seattle → Cleveland (D). see No. 170: Cleveland → Seattle. No. 188: Oakland → Green Bay (PD). Oakland traded its sixth-round selection (188th), as well as its sixth-round selection in 1998 (156th), to Green Bay in exchange for Green Bay's fifth-round selection in 1998 (152nd). No. 188: Green Bay → Oakland (D). see No. 163: Oakland → Green Bay. No. 191: New England → Seattle (D). see No. 17: Seattle → New England. No. 191: Seattle → Cleveland (D). see No. 170: Cleveland → Seattle. ^ No. 195: Jacksonville → Tampa Bay (D). see No. 182: Tampa Bay → Jacksonville. ^ No. 198: San Francisco → Atlanta (PD). San Francisco traded its sixth-round selection (198th) to Atlanta in exchange for Atlanta's seventh-round selection in 1998 (215th). ^ No. 201: Denver → Philadelphia (PD). Denver traded its sixth-round selection (201st) to Philadelphia in exchange for Philadelphia's seventh-round selection in 1998 (200th). No. 207: Cleveland → Chicago (D). see No. 174: Chicago → Cleveland. No. 207: Chicago → Cleveland (D). Chicago traded its seventh-round selection (207th) to Cleveland in exchange for Cleveland's two seventh-round selections (221st and 253rd). ^ No. 212: St. Louis → Green Bay (PD). St. Louis traded its seventh-round selection (212th) to Green Bay in exchange for quarterback Steve Bono in 1998. ^ No. 213: Chicago → Green Bay (PD). Chicago traded its seventh-round selection (213th) to Green Bay in exchange for running back Glyn Milburn in 1998. ^ No. 213: San Diego → Pittsburgh (PD). San Diego traded its seventh-round selection (214th) to Pittsburgh in exchange for running back Erric Pegram in 1997. ^ No. 221: Cleveland → Chicago (D). see No. 207: Chicago → Cleveland. ^ No. 223: Seattle → NY Jets (PD). Seattle traded its seventh-round selection (223rd) to NY Jets in exchange for quarterback Glenn Foley in 1999. ^ No. 228: Arizona → Pittsburgh (PD). Arizona traded its seventh-round selection (228th) to Pittsburgh in exchange for cornerback J. B. Brown in 1998. ^ No. 231: Miami → NY Giants (PD). Miami traded its seventh-round selection (231st) to NY Giants in exchange for running back Tyrone Wheatley in 1999. No. 232: Green Bay → Detroit (PD). Green Bay traded its seventh-round selection (232nd) to Detroit in exchange for running back Glyn Milburn in 1998. No. 232: Detroit → Miami (D). see No. 70: Miami → Detroit. ^ No. 233: Jacksonville → Tampa Bay (D). see No. 182: Tampa Bay → Jacksonville. ^ No. 253: Cleveland → Chicago (D). see No. 207: Chicago → Cleveland. ^ San Diego forfeited its second-round selection after selecting defensive tackle Jamal Williams in the second round of the 1998 supplemental draft. ^ Green Bay Packers forfeited its second-round selection after selecting offensive guard Mike Wahle in the second round of the 1998 supplemental draft. A supplemental draft was held in the summer of 1999. For each player selected in the supplemental draft, the team forfeits its pick in that round in the draft of the following season. The New England Patriots were the only team to select a player, selecting cornerback J'Juan Cherry from Arizona State in the 4th round. On February 2, 2019, Champ Bailey was elected to the Professional Football Hall of Fame in his first year of eligibility. ^ Justice, Richard (April 21, 1998). "Gilbert Signs With Panthers". The Washington Post. Retrieved 2017-04-02. The 1998 Kentucky Wildcats football team represented the University of Kentucky in the 1998 NCAA Division I-A football season. Quarterback Tim Couch was the first pick overall in the 1999 NFL Draft. Antuan Edwards (born May 26, 1977 in Starkville, Mississippi) is a retired American football player. He played safety in the National Football League. Edwards was drafted by the Green Bay Packers in the first round (25th overall) of the 1999 NFL Draft out of Clemson University. Cameron Spikes (born November 6, 1976, in Madisonville, Texas) is a former American football guard in the National Football League. He was drafted by the St. Louis Rams in the fifth round of the 1999 NFL Draft. He played college football at Texas A&M. Jerame Dean Tuman (born March 24, 1976) is a former American football tight end. He was drafted by the Pittsburgh Steelers in the fifth round of the 1999 NFL Draft. He won Super Bowl XL with the Steelers, defeating the Seattle Seahawks. He played college football at Michigan. He also has played for the Arizona Cardinals of the National Football League. John Bernard Tait (born January 26, 1975) is a former American football offensive tackle, who played for both the Kansas City Chiefs and the Chicago Bears of the National Football League. He was selected with the 14th overall pick in the 1999 NFL Draft by the Kansas City Chiefs out of Brigham Young University and played for the Chiefs for five years. Kristofer Martin Farris (born March 27, 1977) is a former American college and professional football player who was an offensive tackle in the National Football League (NFL) for a single season in 2001. He played college football for the University of California, Los Angeles, earned All-American honors and won the Outland Trophy! He was drafted in the third round of the 1999 NFL Draft by the Pittsburgh Steelers, and played professionally for the NFL's Buffalo Bills. Lucas George Petitgout (born June 16, 1976) is a former American football offensive tackle in the National Football League. He was drafted by the New York Giants 19th overall in the 1999 NFL Draft. He played college football at Notre Dame. Petitgout also played for the Tampa Bay Buccaneers. He played a total of 9 seasons in the NFL. The Ricky Williams trade was a trade between the New Orleans Saints and Washington Redskins of the National Football League (NFL), which occurred prior to the 1999 NFL draft. Mike Ditka of the Saints wanted to move up in the draft order to ensure that he would be able to select Ricky Williams from the University of Texas at Austin. To do so, he traded every pick he had in the draft for the fifth overall selection, which he used to select Williams. The Saints struggled in the 1999 season, and Ditka was fired. Williams played for the Saints for three seasons before he was traded to the Miami Dolphins. Russell Morgan Davis (born March 28, 1975) is a former American football defensive tackle. He was originally drafted by the Chicago Bears in the second round of the 1999 NFL Draft. He played college football at the University of North Carolina at Chapel Hill. The Chicago Bears selected Davis in the second round and 49th overall in the 1999 NFL Draft, and Davis played the 1999 season for the Bears. Davis then played for the Arizona Cardinals from 2000 to 2005, the Seattle Seahawks in 2006, and the New York Giants in 2007 and won the Super Bowl XLII title with the Giants that year.